ST. PAUL, Minn. — Minnesota Gov. Mark Dayton is set to appoint a replacement Wednesday for Sen. Al Franken amid pressure to choose someone who could keep the seat in Democratic hands in a special election next November. An announcement from Dayton’s office Tuesday said nothing about his choice, and Dayton has deflected questions about the appointment since Franken announced last week he would step down following allegations of sexual misconduct. Tina Smith, Dayton’s lieutenant governor and trusted former chief of staff, was widely considered his first choice. 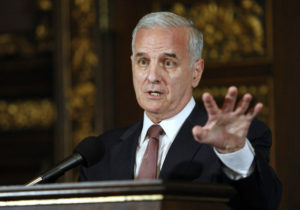 A Democratic official told The Associated Press last week that Dayton was ready to choose Smith as a placeholder before coming under pressure from national Democrats to appoint someone who could leverage the appointment into a 2018 run. That official and a second Democratic operative said that Smith was considering a 2018 run amid that pressure. Both Democrats spoke on condition of anonymity to speak freely about private discussions ahead of an announcement. Smith, who earlier this year passed up an expected campaign for governor, did not immediately respond to telephone messages Tuesday. She has not responded to questions about the appointment since Franken announced plans to resign in coming weeks. Smith, 59, a native of Albuquerque, New Mexico, arrived in Minnesota in 1984 to take a marketing job with General Mills. She became increasingly politically active in the 1990s, founding a marketing and political consulting firm in 1992. She managed the unsuccessful 1998 gubernatorial campaign of former Vice President Walter Mondale’s son, Ted Mondale, and did the same for the elder Mondale’s abbreviated Senate campaign in 2002 after Sen. Paul Wellstone’s sudden death. She also served as a vice president of external affairs for Planned Parenthood Minnesota, North Dakota and South Dakota, from 2003 to 2006. After that, she served as chief of staff to Minneapolis Mayor R.T. Rybak before taking the same job with Dayton. The special election for Franken’s seat is certain to be a closely watched and highly expensive race for what amounts to a swing seat. Republicans have already floated the possibility that former two-term Gov. Tim Pawlenty might enter the race, giving them a candidate with widespread name recognition and an ability to raise plenty of money. In a sign of Pawlenty’s potential formidability, a top Democratic-allied interest group, Alliance for a Better Minnesota, last month paid for a poll attacking him at a time when he was said to be considering a run for governor. Pawlenty deflected questions about a Senate run Tuesday in an appearance on CNN, where he weighed in on the Alabama Senate race against Republican Roy Moore’s candidacy.